New level selector (picture above): still a work in progress but I am happier with it now. In order to play locked levels, players have to fulfill requirements like solving a level with vampires or solving hard levels. I suspect the design will keep changing. Added several levels to smooth out the beginning of the game: I noticed most players feel the game ramps up too fast before they have a chance to feel they have a good foothold on how things work. 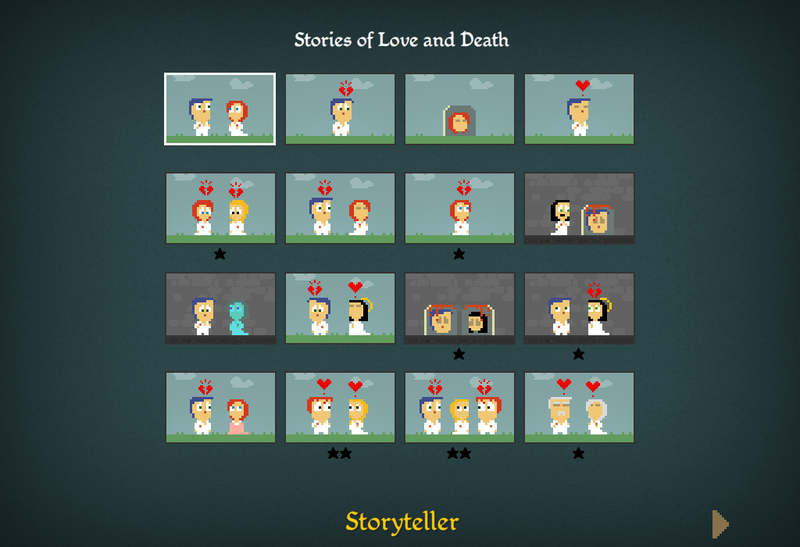 Drastically reduced memory trashing and consumption, with an increased framerate as bonus: Storyteller is a fairly simple game, but the design of the story simulator means *a ton* of function calls and memory trashing, resulting in a brief unresponsiveness whenever the story is simulated. Dozens of fixes and improvements to simulator rules. I am still changing fundamental mechanics in the game, looking for the design that I find satisfactory. Some games are designed incrementally, where a core that is completely solid gets expanded by adding new things and enhancing old ones. Storyteller is not like that. The entangled nature of the simulator rules means a change somewhere ripples through everything else in unpredictable ways, so the core is always shifting. Also, soon I'll be announcing a set of interesting things that will happen during October and November!